From left: Co-chair Dan Calista, Vynamic founder and CEO; Mayor Michael Nutter; Councilman Bill Greenlee. Mayor Michael Nutter’s Paid Sick Leave Task Force, first convened in May of this year, today released a 42 page report with a set of findings and recommendations for implementing paid sick leave policy for non-government employees. Nutter held a hastily-convened press conference this morning. If utilized in future legislation, approximately 120,000 employees out of an estimated 200,000 could expect paid sick leave, according to the report. There are currently 35% of workers without this benefit, according to Census and Bureau of Labor Statistics data. “The time to re-examine the issue of paid sick leave is now,” the report’s authors urged. City Council passed legislation on two different occasions – once in 2011 and another in 2013 – of which Nutter vetoed, citing concerns about the impact such a law would have on job creation and businesses. Critics of Nutters’ opposition to the legislation claim that corporate interests – including Comcast, a major campaign contributor to the mayor – played a much more significant role in influencing his decision. Health Federation of Philly’s Natalie Levkovich, a task force co-chair, said during this morning’s press conference, however, that there was “no material evidence” to support claims from Nutter and some of the city’s business class that paid sick leave would have a detrimental effect on the local economy. Teofilo Reyes, National Research Director for Restaurant Opportunities Center United, and task force member, was not immediately available for comment regarding perceived strengths and downsides to today’s report. ROC United organized and lobbied strongly in favor of past legislation, and was a vocal critic of Nutter and other opponents in 2011 and 2013. The report asserts that the gains future legislation would provide to local employees include benefits to public health and low wage workers – particularly women and minorities – as well as the impact sick workers routinely have on workplace productivity. 2013 legislation mandated that businesses with five or more employees must provide paid sick leave to their workers; the report currently recommends businesses with 15 or more. Those with less than 15 employees would be required to give “unpaid, earned sick time” but would accrue just as those employees receiving paid sick leave: one hour per 40 hours worked. Exempt employees include federal and state employees, those involved in collective bargaining, temporary workers (less than 90 days), adjunct faculty academics, and independent contractors, among others. 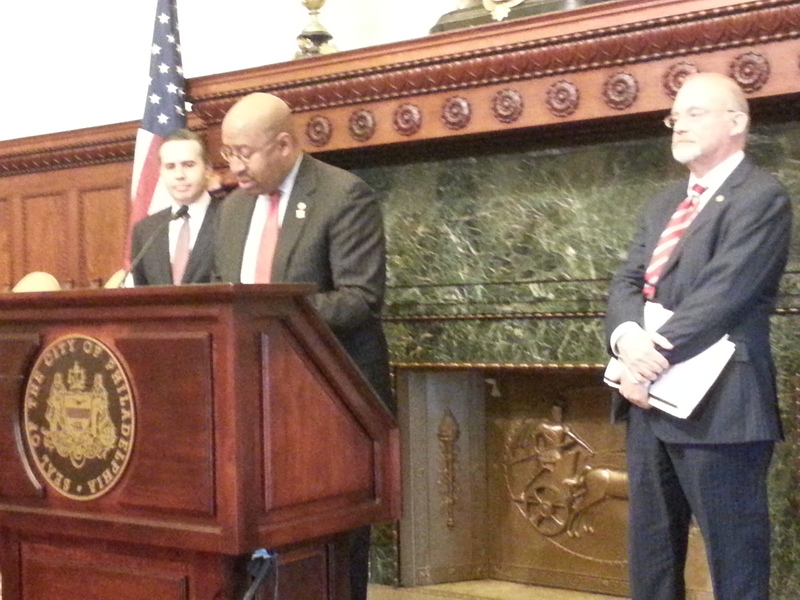 At today’s press conference, Councilman Bill Greenlee, the leading city proponent of paid sick leave in Philadelphia, expects a bill will be presented for Nutter’s signature early next year. He also stated that more negotiations lay ahead as the bill moves through Council.